"Jersey Shore" was a WWII Japanese plot! 11 Responses to "Jersey Shore" was a WWII Japanese plot! Hey gang, the 40’s have paid us a visit today! And it looks like they’ve brought with them what appears to be a buck-toothed, yellowed-skinned, Engrish-speaking, Asian stereotype. What was his name again? Ah…Jap Anne Nipperson. Joshua, you wouldn’t believe the kind of stuff I’ve found rummaging through these 40s and 50s era comics. I’ve got a folder with some of the more egregious stuff in it, but believe me, what you’ve rightly pointed out is very, very tame comparatively speaking. 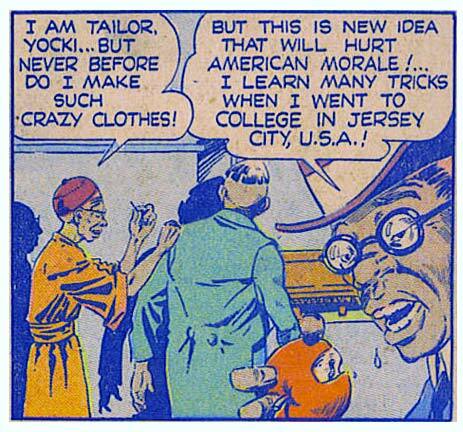 And it’s not just the Japanese and Germans (with whom, after all, we were at war), but the stuff on African Americans is pretty raw by modern standards. “It was a different time”, I know, but some of it’s pretty hard to look at regardless. Staying on Cracked but deviating from the racism, I found this one that had me laughing so friking hard, I couldn’t resist posting it. I tried to go to those links, but I’m at work, where the firewall prohibits what it considers “Tasteless & Offensive.” Clearly tne firewall program has higher ethics and social sensitivity than I do. Didn’t the ‘Airboy’ inker have any black ink? @Worf: Most lines mean little to me, and warnings make me curious. But yes, mine is one of THOSE companies. I’ll have to take a look on my own time, when I have any. I think this cover is even worse.